Decided on a strategy of riding from Valloire up to Col du Telegraphe (5km uphill), then descending Telegraphe to turn around at the bottom and begin my benchmark ride to Col du Galibier some 35 km away. Ride started off well, decided to take it easy and just find myself at the base of Telegraphe whenever I got there, which is a good thing because there was some rain as I descended. Took some pictures, enjoyed the scenery and the smell of rain on the pavement. Reaching the bottom of Telegraphe, I turned around, took one last picture and then shot uphill to the Category 1, 12km summit in 45 minutes. At this point I was in ‘conservation’ mode, trying to keep things easy and spin up in as small a gear as I could without losing too much time. I had a goal of about 2 hours to summit Galibier, a time I’d achieved back in 2006 so I wanted to be mindful of the big climb that came after Telegraphe. You may be thinking (as I am), 2 hours to ride 35 kilometres? Yes, sadly, it means an average speed of nearly 17km’h to haul myself up 30 km (from the base of Telegraphe) of climbing, only descending 5km of the 35. I can assure you that the podium hopefuls in the Tour are doing this exact route (as they did in Stage 19 this year) in less than 90 minutes...scary. Things seemed to be going along pretty decent for the first 3 kilometres and then reality set-in, this isn’t Alpe d’Huez, Platzerwasel or any other climb. I’ve waited 5 years to climb this Goliath of a mountain and it’s really happening. Galibier commands all of your attention, focus and concentration. You’re constantly giving yourself feedback (self-talk) about your pedaling cadence, your position on the bike, the way you are applying pressure to the pedal stroke (pedaling circles with power, 360 degrees), watching the pitch in the road, hitting the switchbacks and banking off them to gain some speed, checking your breathing, your heart rate and at the same time watching traffic and taking notice of what the weather is doing. You’re monitoring all of these factors as you pull on the brake hoods with each pedal stroke, alternating with the tops of the bars and taking note of what your back is doing and how it’s being used for each revolution. You get tired and feel your cadence start to slow a bit so you get out of the saddle and stop on the pedals a few hundred metres and then sit back down, paying attention to how far back you are sitting, ensuring you are pulling back and up, getting good use of those hamstrings. On today’s ride I had the good fortune of amazing weather on Galibier and some riders (ahead) acting as carrots that dangled in front of me: a goal. Climbing on, I hit markers for 5 then 4 kilometres to the summit. I climbed on. Never shared this before but back in 2005, the first time I climbed Col du Galibier it was at this 4k point to the summit (and I’ll never forget it) that I had a mini-meltdown and was forced to get off my bike and stand there completely dumbfounded at what was happening and why I wasn’t still on my bike riding up the mountain. After a few minutes I did get back on my bike to crawl up the mountain toward the summit but again with 2k to go my mind started wandering and I became flooded with emotion at about 2400m of elevation. I chalked it up to fatigue and hypoxia and pressed on until I reached the top. The second time I did Galibier in 2006 I rode-on past that 4k marker on the side of the road but again had this overwhelming emotional release-thing with 2k to summit. Well, today I wanted to make sure that that 4k marker wasn’t going to be a sticking point for my ride and I needed to prove to myself that last time wasn’t a fluke, so I made a point of standing and stomping on my pedals when I reached it. No fluke, we’re good at the 4k to summit point. Something about 2k ‘to go’ still has me... I’ll never understand it: 3 for 3. Last kilometre of Galibier is ridiculously hard. You’ve been climbing steady since the base of Telegraphe for 29km and then it hits you like a wall. It taunts and toys with you because you can see the summit and the few people that are up there and although it’s only 1000 metres away (and then you start breaking it down to the simplest form, recalling a ride when you were a kid to the corner store) you are dying and you have almost nothing left when you finally reach that damn sign that says “Col du Galibier – 2645m”. Taking a picture of (what else) the sign, I zip-up and begin my 18km descent into Valloire thus signalling the end of my ride and the end of this trip. Descending has to be one of my favourite things to do on this planet, passing cars, motorbikes, other cyclists, it’s exhilarating and you feel alive. Nearly running out of road a few times around corners I had the opportunity to remind myself that ‘this is what it’s all about’. You ride with everything you’ve got and you take up every available centimetre of the road and if you’re going too fast into a corner or see an oncoming car when you’re trying to pass, it will always work out. When tears are streaming from your eyes, the air rushing all around you, your chest and knees tucked snugly to the top tube and your eyes focused as far ahead as possible (and on the small rocks/sand/water on the road directly in front) and the ground moving underneath you at tremendous speed; it is in this very moment that I feel calm and free, infallible and invincible. Part of my ‘plan’ today was to summit Galibier and then descend to Col Lautaret and climb the south side of Galibier before heading back to the hotel but Jekyll won, Hyde lost and sanity prevailed. Reaching the summit today at 2:03, I decided it was a success (in its own right) and I had nothing further to prove on this ride. One of the great things about the mountains is that they will always be here. They are a constant that will never change; only we will. I’ve already set a goal for myself to do the same ride in 1:50 when I return. 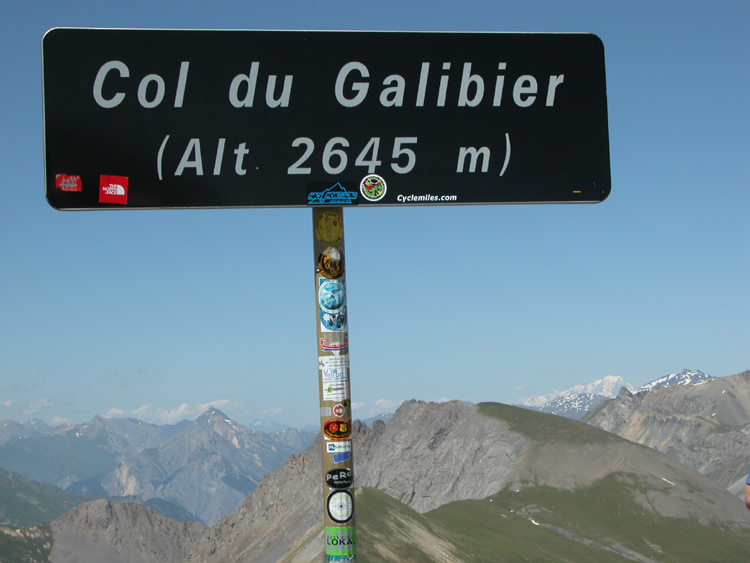 Col du Galibier is truly one of the most mythical mountains in the Tour de France. It will continue to inspire, motivate and evoke emotions I didn’t know I had. Climbing Galibier is the closest I’ve come to a spiritual awakening. It has the capacity to be that powerful. You never feel alone when you’re on your way up even when you’re that close to your breaking point. A powerful force or divine intervention visits you; drives you, propels you and lifts you to that next switchback when all you want to do is give up and quit.